Cassowary is the common name for any of the very large, flightless birds comprising the ratite genus Casuarius, characterized by powerful legs with three-toed feet with sharp claws, a long dagger-like claw on the inner toe, small wings, a featherless head, and a horny crest on the head. These ratites are native to New Guinea, northeastern Australia, and various other islands in the Australo-Papuan region. There are three extant species recognized today and one extinct species. The southern cassowary (Casuarius casuarius) is the third largest flightless bird on the planet, smaller only than the ostrich and emu. Cassowaries provide important ecological functions, acting as a keystone species in rain forests by consuming fallen fruit and dispersing the seeds. In addition to feeding largely on fruits, they also feed on other plant matter and some invertebrates and vertebrates. These large birds, with powerful legs and claws and fast running ability, have few predators as adults, but their eggs and young are consumed upon by various animals, such as lizards and other birds. Humans also collect their eggs and eat the animals for food. In New Guinea, cassowary eggs are brought back to villages and the chicks raised for eating as a much-prized delicacy, despite (or perhaps because of) the risk they pose to life and limb. Cassowaries are very shy, but when disturbed, they are capable of inflicting serious injuries to dogs and children, and have been called the most dangerous bird on the planet. Cassowaries are one of several taxa of ratites, a grouping of flightless birds characterized by a flat, raft-like sternum (breastbone) lacking the keel for attachment of wing muscles that is typical of most flying birds and some other flightless birds. Among other ratites are ostriches, emus, rheas, kiwis, and elephant birds. The three living species of cassowaries, comprising the genus Casuarius, are the southern cassowary or double-wattled cassowary (C. casuarius), the dwarf cassowary or Bennett's cassowary (C. bennetii), and the northern cassowary or single-wattled cassowary (C. unappendiculatus). Cassowaries are large birds, with females tending to be bigger and more brightly colored. Adult Southern Cassowaries are 1.5 to 1.8 meters (59–71 inches) tall, although some females may reach 2 meters (79 inches) (Panse 2006) and weigh 58.5 kilograms (129 lb) (Davies 2002). All cassowaries have feathers that consist of a shaft and loose barbules. They do not have retrices (tail feathers) or a preen gland. Cassowaries have small wings with 5 to 6 large remeges (flight feathers). These are reduced to stiff, keratinous quills, like porcupine quills, with no barbs (Davies 2002). There is a claw on each second finger (Harmer and Shipley 1899). The furcula and coracoid are degenerate, and their palatal bones and sphenoid bones touch each other (Davies 2003). A cassowary's three-toed feet have sharp claws. The second toe, the inner one in the medial position, sports a dagger-like claw that is 125 millimeters (4.9 inches) long (Davies 2002). This claw is particularly fearsome since cassowaries sometimes kick humans and animals with their enormously powerful legs. Cassowaries can run up to 50 kilometers/hour (31 miles per hour) through the dense forest. They can jump up to 1.5 meters (4.9 feet) and they are good swimmers, crossing wide rivers and swimming in the sea as well (Harmer and Shipley 1899). Detail of a southern cassowary head. All three species have horn-like crests called casques on their heads, up to 18 cm (7.1 in) (Davies 2003). These consist of "a keratinous skin over a core of firm, cellular foam-like material" (Crome and Moore 1988). Several functions for the casques have been proposed. One possibility is that they are secondary sexual characteristics. Other suggestions include that they are used to batter through underbrush, as a weapon for dominance disputes, or as a tool for pushing aside leaf litter during foraging. The latter three are disputed by Mack and Jones (2003), who suggest, based on personal observations, that the casque amplifies deep sounds (Mack and Jones 2003). However, Crome and Moore (1988) note that the birds do lower their heads when they are running "full tilt through the vegetation, brushing saplings aside and occasionally careering into small trees. The casque would help protect the skull from such collisions." Mack and Jones also speculate that the casques play a role in either sound reception or acoustic communication. This is related to their discovery that at least the dwarf cassowary and southern cassowary produce very-low frequency sounds, which may aid in communication in dense rainforest (Mack and Jones 2003). This "boom" is the lowest known bird call, and is on the edge of human hearing (Owen 2003). The name cassowary comes from the Malay name kesuari (Gotch 1995). Cassowaries are native to the humid rainforests of New Guinea and nearby smaller islands, and northeastern Australia (Clements 2007). They will, however, venture out into palm scrub, grassland, savanna, and swamp forest (Davies 2003). It is unclear if some islands populations are natural or the result of trade in young birds by natives. Cassowaries are solitary birds except during courtship, egg-laying, and sometimes around ample food supplies (Davies 2003). Cassowaries are largely frugivorous; fallen fruit, such as the cassowary plum and fruit on low branches is the mainstay of their diet. They also will eat other plant food, such as grass seeds and shoots. However, all three extant species are truly omnivorous, and they also will eat fungi, snails, insects, frogs, and snakes. They are a keystone species of rain forests because they eat fallen fruit whole and distribute seeds across the jungle floor via excrement (Davies 2003). Females lay three to eight large, pale green-blue eggs in each clutch into a prepared heap of leaf litter (Davies 2003). These eggs measure about 9 by 14 centimeters (3.5 inches × 5.5 inches)—only ostrich and emu eggs are larger. The female does not care for the eggs or the chicks; the male incubates the eggs for 50 to 52 days, removing or adding litter to regulate the temperature, then protects the brown-striped chicks for nine months, defending them fiercely against all potential predators, including humans (Davies 2003). Cassowaries feed on the fruits of several hundred rainforest species and usually pass viable seeds in large dense scats. They are known to disperse seeds over distances greater than a kilometer, and thus probably play an important role in the ecosystem. Germination rates for seeds of the rare Australian rainforest tree Ryparosa were found to be much higher after passing through a cassowary's gut (92 versus 4 percent) (Weber and Woodrow 2004). Casuarius casuarius, southern cassowary or double-wattled cassowary, found in southern New Guinea, northeastern Australia, and the Aru Islands (Clements 2007), mainly in lowlands. 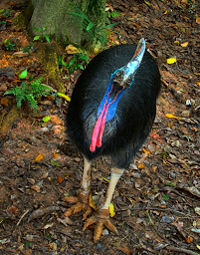 Casuarius bennetti, dwarf cassowary or Bennett's cassowary, found in New Guinea, New Britain, and on Yapen (Clements 2007), mainly in highlands. Casuarius unappendiculatus, northern cassowary or single-wattled cassowary, found in the northern and western New Guinea, and Yapen (Clements 2007; Davies 2002), mainly in lowlands. Presently, most authorities consider the above monotypic, but several subspecies have been described of each, and some have even been suggested as separate species, such as C. (b) papuanus (Davies 2003). It has proven very difficult to confirm the validity of these due to individual variations; age-related variations; the relatively few available specimens; and the fact that the bright skin of the head and neck—the basis of which several subspecies have been described—fades in specimens (Davies 2003). In addition, local inhabitants are known to have traded live cassowaries for hundreds, if not thousands, of years, some of which are likely to have escaped/been deliberately introduced to regions away from their origin (Davies 2003). 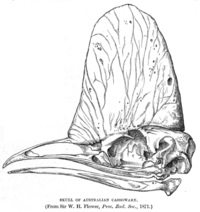 The evolutionary history of cassowaries, as of all ratites, is not well known. A fossil species was reported from Australia, but for reasons of biogeography this assignment is not certain and it might belong to the prehistoric "emuwaries," Emuarius, which were cassowary-like primitive emus. The southern cassowary is endangered in Queensland, Australia. Kofron and Chapman (2006) assessed the decline of this species. They found that, of the former cassowary habitat, only twenty to twenty-five percent remains. They stated that habitat loss and fragmentation is the primary cause of decline (Kofron and Chapman 2006). They then studied 140 cases of cassowary mortality and found that motor vehicle strikes accounted for fifty-five percent of them, and dog attacks produced another eighteen percent. Remaining causes of death included hunting (5 cases), entanglement in wire (1 case), the removal of cassowaries that attacked humans (4 cases), and natural causes (18 cases), including tuberculosis (4 cases). Fifteen cases were for unknown reasons (Kofron and Chapman 2006). Hand feeding of cassowaries poses a big threat to their survival (Borrell 2008). In suburban areas, the birds are more susceptible to vehicles and dogs. Contact with humans encourages cassowaries to take most unsuitable food from picnic tables. Feral pigs also are a huge problem. They probably destroy nests and eggs; but their worst effect is as competitors for food, which could be catastrophic for the cassowaries during lean times. Cassowaries have a reputation for being dangerous to people and domestic animals. 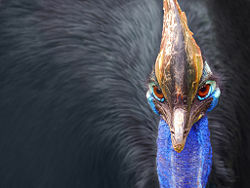 The 2007 edition of the Guinness World Records lists the cassowary as the world's most dangerous bird. During World War II, American and Australian troops stationed in New Guinea were warned to steer clear of them. Cassowary attacks occur every year in Queensland, Australia. However, the extent of the danger appears to be somewhat overstated. For example, many internet entries about cassowaries claim that they can disembowel a man or dog with one kick, with the long second toe claw cutting the gut open. This belief has been repeated in print by authors including Paul (1988) and Diamon (1997). However, research on cassowary attacks has been unable to substantiate a single claim of any cassowary disemboweling any person or animal (Kofron 2003). In addition, unprovoked attacks are rare. Of 221 attacks that have been documented and studied, 150 were against humans. About 75 percent of these were from cassowaries that had been fed by people. About 71 percent of the time the bird chased or charged the victim and 15 percent of the time they kicked. Of the attacks, 73 percent involved the birds expecting or snatching food, 5 percent involved defending natural food sources, 15 percent involved defending themselves from attack, and 7 percent involved defending their chicks or eggs. Of the 150 attacks, there was one human death (Kofron 1999). The one documented human death caused by a cassowary was that of Phillip Mclean, aged 16 years old, and it happened on April 6, 1926. He and his brother, aged 13, were attempting to beat the cassowary to death with clubs. They were accompanied by their dog. The bird kicked the younger boy, who fell and ran away. Then the older boy struck the bird. The bird charged and knocked the older boy to the ground. While on the ground, Phillip was kicked in the neck, opening a 1.25 centimeter wound. Phillip got up and ran but died shortly afterward from the hemorrhaging blood vessel in his neck (Kofron 1999). Cassowary strikes to the abdomen are among the rarest of all, but there is one case of a dog that was kicked in the belly in 1995. The blow left no puncture, but there was severe bruising. The dog later died from an apparent intestinal rupture (Kofron 2003). Brands, S. 2008. Genus Casuarius. Systema Naturae 2000. Retrieved February 13, 2009. Clark, P. (ed.). 1990. Stay in touch. The Sydney Morning Herald November 5, 1990. Clements, J. 2007. The Clements Checklist of the Birds of the World, 6th edition. Ithaca, NY: Cornell University Press. ISBN 9780801445019. Crome, F., and L. Moore. 1988. The cassowary’s casque. Emu 88: 123–124. Davies, S. J. J. F. 2002. Ratites and Tinamous. New York: Oxford University Press. ISBN 0198549962. Davies, S. J. J. F. 2003. Cassowaries. Pages 75-77, in M. Hutchins, ed., Grzimek's Animal Life Encyclopedia, volume 8. Birds I. Tinamous and Ratites to Hoatzins. Farmington Hills, MI: Gale Group. ISBN 0787657840. Diamond, J. 1997. Guns, Germs, and Steel: The Fates of Human Societies. W.W. Norton. ISBN 0393038912. Gotch, A. F. 1995. Cassowaries. Pages 178-179 in Latin Names Explained. A Guide to the Scientific Classifications of Reptiles, Birds & Mammals. New York: Facts on File. ISBN 081603377. Harmer, S. F., and A. F. Shipley. 1899. The Cambridge Natural History. Macmillan and Co.
Kofron, C. P. 1999. Attacks to humans and domestic animals by the southern cassowary (Casuarius casuarius johnsonii) in Queensland, Australia. Journal of Zoology 249(4): 375-381. Retrieved February 13, 2009. Kofron, C. P. 2003. Case histories of attacks by the southern cassowary in Queensland. Memoirs of the Queensland Museum 49(1): 335-338. Kofron, C. P., and A. Chapman. 2006. Causes of mortality to the endangered southern cassowary Casuarius casuariusjohnsonii in Queensland, Australia. Pacific Conservation Biology 12: 175-179. Mack, A. L., and J. Jones. 2003. Low-frequency vocalizations by cassowaries (Casuarius spp.) The Auk 120(4): 1062–1068. Retrieved February 13, 2009. Owen, J. 2003. Does rain forest bird "boom" like a dinosaur?. National Geographic News November 4, 2003. Retrieved February 13, 2009. Panse, S. 2006. The cassowary bird. Buzzle.com. Retrieved February 13, 2009. Paul, G. S. 1988. Predatory Dinosaurs of the World. New York: Simon and Schuster. ISBN 671619462. Underhill, D. 1993. Australia's Dangerous Creatures. Sydney, New South Wales: Readers Digest. ISBN 0864380186. Weber, B. L., and I. E. Woodrow. 2004. [http://cat.inist.fr/?aModele=afficheN&cpsidt=15880854 Cassowary frugivory, seed defleshing and fruit fly infestation influence the transition from seed to seedling in the rare Australian rainforest tree, Ryparosa sp. nov. 1 (Achariaceae). Functional Plant Biology 31: 505-516. Retrieved February 13, 2009. This page was last modified on 17 January 2017, at 17:14.